[The taddhitá 76 affix 3.1.1 pháK 99 is introduced after 3.1.2 the class of nominal stems 1] beginning with hárita- `n.pr.' [ending in 1.1.72 the sixth sUP triplet to denote a gotrá 98 descendant 92] while [terminating in 1.1.72 the taddhita 76 affix 3.1.1] aÑ (104). Source: From Aṣṭādhyāyī of Pāṇini In Roman Transliteration translated by Sumitra M. Katre, Copyright © 1987. Courtesy of the University of Texas Press. haritādirbidādyantargaṇaḥ. haritādibhyo 'ñantebhyo 'patye phak pratyayo bhavati. iño 'pavādaḥ. 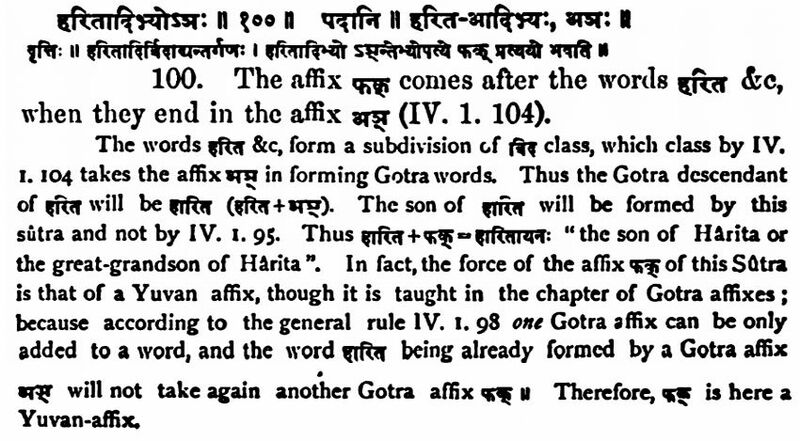 haritasya apatyaṃ hāritāyanaḥ. kaindāsāyanaḥ. nanu ca gotre iti vartate. na ca gotrādaparo gotrapratyayo bhavati eko gotre 4-1-93 iti vacanāt? satyam etat. iha tu gotrādhikāre 'pi sāmarthyād yūni pratyayo vijñāyate. gotrādhikāras tu uttarārthaḥ. haritā'dibhyo 'ñaḥ 4.1.100 haritādirbidādyantargaṇaḥ. haritādibhyo 'ñantebhyo 'patye phak pratyayo bhavati. iño 'pavādaḥ. haritasya apatyaṃ hāritāyanaḥ. kaindāsāyanaḥ. nanu ca gotre iti vartate. na ca gotrādaparo gotrapratyayo bhavati eko gotre 4.1.93 iti vacanāt? satyam etat. iha tu gotrādhikāre 'pi sāmarthyād yūni pratyayo vijñāyate. gotrādhikāras tu uttarārthaḥ. Bālamanoramā2: haritādibhyo'ñaḥ 1086, 4.1.100 "haritādibhyo'ña" ityādi spaṣṭam.